MOUNT GILEAD — Northmor head football coach Scott Armrose said Friday night’s 54-26 win over Mount Gilead was his club’s best overall offensive performance. The Golden Nights (6-2, 3-2) scored in a variety of ways to beat the Indians (0-8, 0-5) and spoil homecoming. “Defense, special teams, offense, throwing and running the ball. It was our best overall all-around game as far as scoring goes,” Armrose said. He credited the Indians with a strong performance of their own. Mollohan kept the Mount Gilead offense going with a stellar receiving night, catching eight passes from quarterback Seth Young for 143 yards and two touchdowns. But Northmor scored early and often, going ahead 47-12 at halftime thanks to several big plays. Demetrius Johnson scored the first of his four touchdowns on a 22-yard burst off the left side. He finished with 183 yards on just 10 carries, adding scoring runs of 54, 1 and 49 yards. 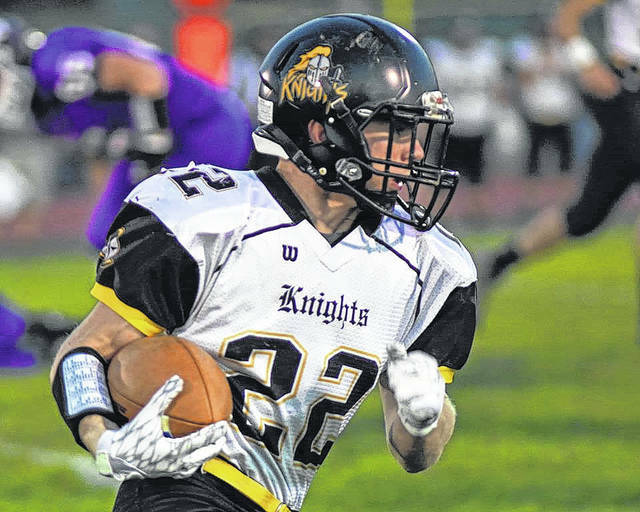 Conan Becker was another spark for Northmor, adding 51 yards rushing and a score. He also returned a Mount Gilead punt 48 yards for a touchdown in the first quarter. Mount Gilead outgained Northmor in total yards 298-267, ran 62 plays to the Knights’ 26 and had more first downs, 20-11. “’Meechie’ Johnson is a special player. He makes a lot of stuff happen; a lot of stuff out of nothing,” said MG coach Joe Ulrey. “We had self-inflicted wounds and they started much of the first half with the ball on our side of the field,” he said. A pick-6 by Wyatt Reeder covering 47 yards put the visitors up 34-6. Bouncing back from a last-second loss to East Knox last week didn’t surprise Armrose. “Our boys do a great job with that, like (losing to) Danville and then playing Cardington,” he said. Northmor plays Centerburg Friday night. Ulrey saw some bright spots despite his team’s eighth loss. Leading the Mount Gilead ground attack was Hunter Trimmer with 114 yards on 24 carries and a two-yard TD run. Sophomore Brady Mermann added a 7-yard touchdown run late in the game. As a team the Indians had 161 yards rushing, with Timmy Brower adding 44 stripes on six trips. Young finished the game 12-of-23 passing for 137 yards. The Indians host Danville Friday night. “We had two really nice drives in the first half, a 12-play drive and an 11-play drive. Not many teams have had success running the ball on them. We got stuff to build off of,” Ulrey said. Seth Young was crowned homecoming king and Molly Brooke queen during pre-game ceremonies. Northmor’s Conan Becker runs for yardage against Mount Gilead Friday night. Becker helped the Golden Knights secure a 54-26 victory. https://www.galioninquirer.com/wp-content/uploads/sites/38/2017/10/web1_22310652_1495271313913222_74515716710223479_n.jpgNorthmor’s Conan Becker runs for yardage against Mount Gilead Friday night. Becker helped the Golden Knights secure a 54-26 victory.